Suitable for Sony Camcorders with the standard ¼ inch screw thread fittings. Gearless extending centre column and quick release leg locks take the stand from the folded height of 530mm (21″) to 1400mm (55″) (excluding camcorder). Ball head mount with tilt adjustment and two bubble levels. Also has grip handle to help with fine-tuning and panning. Suitable for both indoor and outdoor use. Supplied with travel bag for the photographer on the move. 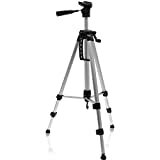 Eliminate camcorder shake and take your video to the next level with this professional spec aluminium tripod. Weighing less than 1kg, it is compact yet strong and ideal for travel. Quick release leg locks enable the tripod to be extendable from the folded height of 53cm (21″) to 140cm (55″) (excluding camcorder) when the gearless extending centre pole is at its maximum. The mount features adjustable tilt levels for quick switching between landscape and portrait videos, together with two spirit levels for fine adjustments. The grip handle enables the 3D ball head to be easily moved in a variety of angles. The camcorder is then rotatable 360 degrees – ideal to pan the landscape in the opening shot to your next movie. Non-slip rubber feet help to balance your camcorder on uneven surfaces. A weight hook also helps to provide extra stability (Weights not included. Maximum recommended load 3kg (6.6lbs). The quick release mount plate lets you remove your camcorder in moments, and legs fold in seconds ready to be put in the zip up travel bag ready for your next video. Suitable for both indoor and outdoor use. This entry was posted in Discount Photography and tagged 140cm, 55”, Aluminium, Camcorders, Carry, Case, CX240E, Extendable, FDRAX100EB, Full, HDRCX405, HDRPJ410, HDRPJ620, HDRPJ810, iGadgitz, Lightweight, Portable, Section, Silver, Sony, Stand, Tripod by Ball Photo. Bookmark the permalink.